So, have any of you ever had a class pet? I've done fish in the past, but that is about as far as I will go with animals in the classroom. However, my students had other ideas about a month ago. Two of my students decided they wanted a class pet. It all started with our research of Peregrine Falcons. Their first idea was to incubate and hatch out own eggs (and what do you do with baby chicks once they've hatched?). THEN, they moved up to bigger (or smaller) and brighter things ... a parakeet. They spent hours and hours researching, writing proposals, and laying the groundwork. That is, until my principal said, "no". They were heartbroken. ...Which brings me to fish. I felt so bad for them! They worked so hard, and pretty much got shot down. I wanted to channel their creative energy into SOMETHING positive. 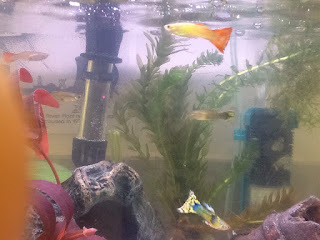 So, now we have guppies. I thought, perhaps, they would be happy just staring at the fish. NOPE! They are researching, learning, and sharing all this new knowledge with eachother. YOU MEAN ONE LITTLE FISH TANK CAN START A LEARNING REVOLUTION?! First, one of my students brought in a heater, water filter, and WATER TESTING SUPPLIES. Yes, water testing supplies. He tests the water every morning to make sure it is healthy for the fish. Now, my students are researching what chlorine and other chemicals can do to our healthy tank. Then, they had a class vote to name all 5 fish and two snails. Why do they always come up with the strangest names? Unfortunately, both snails died in the first day (what did I do wrong?) The funniest things about it was that two of the girls in the class wrote Eulogies. (Creative writing anyone). This week we lost our first fish. Today, three students joined efforts to create a power point presentation eulogy. And the learning STILL has not stopped. Now, they realized that all three female fish are pregnant. The students have researched how guppies have live birth, and are EXTREMELY concerned because the mother fish WILL eat their babies. So, what does that mean? Nursery tank of couse! The plastic container in the bottom is where the female fish will be put when she is ready to have the babies. The babies will swim through the small grate and out of her reach. And I thought I was just buying a few guppies! I suppose this just goes to show that learning can come in some pretty amazing forms! 15 more school days for me ... but whose counting?